Do your customers or readers know who you are? I’m not talking about them knowing about your brand. We mean, do they know who your brand is as if it was a person. Does your brand have a personality? Do your posts tell the world what your company is about along with what you do? To stay relevant in today’s market your brand needs to be knowable and read like an open book. If this is a new concept to you, don’t worry! It’s not too late to start branding your business. We’ve got 10 tips for you to make it easier to turn your company into a friendly face. What do Well Branded Businesses Look Like? Successful businesses are open books in that you know what they stand for. For example, Starbucks stands for good coffee and well-treated employees and suppliers. They market as friendly and welcoming. That’s why employees try to learn names and orders. They want you to believe that each store is a friendly place. That’s their brand: your friendly neighborhood Starbucks. What’s yours? Branding your business is not a quick process. Like anything worth doing, it takes time and effort. If you’re willing to do the work, you’ll be rewarded with more visibility and loyal customers. Let’s think about some big successful brands we know. Google, Netflix, Dunkin Donuts, and Amazon. What do they have in common? They aren’t overachievers. Their brand is one or two things at most. It’s simple. Dunkin Donuts does coffee and donuts, that’s it. Amazon does home delivery of goods, Netflix does streaming, it’s not complicated. A good brand’s services can be easily described and easily remembered. So when you’re branding your business don’t go overboard! No one like a facade. The same is true when it comes to brands consumers commit to. If your company’s brand is about honesty and you’re caught lying about anything – you’re finished. This is something to think about when you’re branding your business, can you live up to your own brand? Before you decide on a solid brand identity, get out your business’ mission statement and values. Look at those and consider your ideas for a brand. Once you’ve decided, write it down. 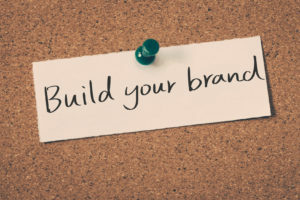 Your brand needs to be concrete, something you can tell marketing directors or people you hire who are new to your company. It has to be concrete. This may come before or after you’ve decided on a concrete brand identity, but either way, it’s important. When you’re building your brand you need to have people remember what you do, as well as who you are. Make sure that your tagline fits within your brand. For example, if your tagline is about being family friendly, make sure you post only family friendly content. In simpler days, it was enough to have your brand be represented by your logo. Now, you need to have appealing and engaging content that is unique to your business. For your company’s Instagram, your logo will be your profile picture, but that should be the only place it’s visible. If it is on your product and you post a picture of that product, that’s ok. Speaking of Instagram, your company needs one. It’s hard to keep up with all the social medias, that’s true. However, if you want to engage younger generations, it’s a necessary evil. When you’re choosing networks to be on . Start small. You don’t want to have accounts that get neglected. Facebook, Instagram, and Snapchat are a must. When you have a presence on different social media networks and otherwise online (emails, website content) you need to stay consistent. Your brand needs to be obvious for your content on each one. Try not to post the same content on each social media network at once, your Facebook page and your Instagram shouldn’t match post for post. If you are announcing something big, tweak the graphic or the picture a little on each network. You should be consistent across networks, but not copy and paste your content. This goes along with creating an honest and fitting brand. When a customer engages with your company in some way, they should feel like your brand is representative of your services. This is a little vague, so let’s go back to the Starbucks example. Their brand is friendly and welcoming. They act on that in person by learning customers names and their orders. That’s what it looks like to be your brand. 9. Brand Ambassadors? Don’t Hire Out! This is a tip for smaller businesses. If you have a huge marketing budget and want Kylie Jenner to advertise your product, then go ahead. If you have a small or medium sized business, you don’t necessarily need a Kylie. You have brand ambassadors right under your nose. Your employees! (Assuming that your employees believe in your product) They are a gold mine of brand content. Pick some companies with similar brands. For example, if part of your brand is about being a local business, feature another local business from time to time. You don’t have to make it extreme. An Instagram post of a snack table at a meeting with a local company’s food and logo visible would be a good example. This is something you should keep in mind when you’re partnering as well: do your brands work well together? Hopefully, we’ve given you some helpful tips for branding your business in today’s ever-changing marketing world. The name of the game in 2017 marketing is engagement and you have to give your consumers something they can engage with. If you’ve already picked a brand for yourself and it’s not working out, re-branding is always an option. You can be successful at branding your business if you work hard at it, even if you don’t have a marketing team. Now go get your brand on!